I don't know where you all have found the time to post photos and write long messages on your blog in the last day or two, as this is the first time I have sat down since my last post! I still have the cake to ice and some presents to wrap, but I am getting there. The girls have just gone to bed - Ruth in tears as she is a bit frightened about the prospect of a strange man in a red suit coming into her bedroom when she's asleep. Not surprisingly really - it is a bit scary when you are 5, even if he does bring great gifts. Looking forward to visiting you all again in the New Year (we are off to my parents for a big family celebration), and to hearing all about your festivities. Hi everyone. I hope all your festivities are coming together and the season of excitement is upon you. It has certainly hit this house with a vengeance! The girls are so bouncy and excited, and on the whole it is happy excitedness, but has occasionally tipped the other way. As a bribe to avoiding the end of term disco (which they never enjoy, and ends up costing me an arm and a leg) Sophie and I promised Grace, Ruth, Anna and Ebba dinner out, including dressing up, so last night we took them to Frankie & Benny's for tea. They had a great time, and we shared a bottle of wine, before walking back through town to look at the lights. They all double-skipped home (a new phrase to me, but means skipping with arms linked behind, apparently) and were so happy and giggly that it has infected me too, despite being bunged up with a cold, and doing a very good Rudolph impersonation. 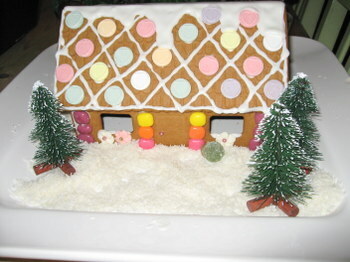 We also put together our gingerbread house, which wasn't as easy as I was led to believe! I did get rather mad whilst I was doing it, and the girls gave me a wide berth until it was constructed! It was an Ikea kit, and the chimney was broken which was probably just as well because trying to put that together could have tipped me over the edge. Anyway, I am pleased with my first ever attempt, and the dining room now smells of gingerbread, so it was worth the effort. Mix all ingredients then place in a dish in oven for approx 30 mins at 200 C until sauce has thickened and cranberries are soft. 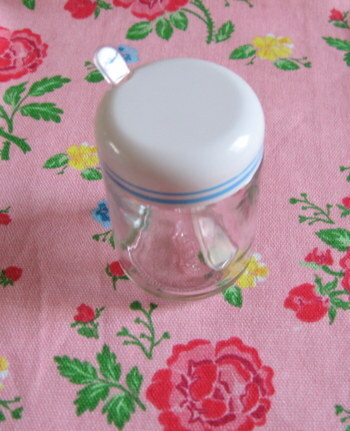 Put in sterilised jars (makes 1 and a half jam jars full). Keeps in fridge for 2 weeks. Easy peasy. I managed to defrost my freezer last night, and nearly lost several fingers to frost bite in the process. I left it until the Sainsbury's delivery had come, so I put it all the food out in the garden whilst I chiseled all the frost off with a wallpaper scraper. I filled 4 washing up bowls with ice, but now have room for everything with even some space for extras now, so I am feeling very virtuous. The fact that I did it at 11 at night with a streaming cold makes me feel even more saintly! Andy and I are off late night shopping tonight without the girls, and I am looking forward to sampling some Winter Pimms in front of the fire when we get back. You mix it with apple juice and heat it up apparently. Sounds yummy. I've nearly done all my shopping, but just need a few last minute bits and bobs. I also realised I don't have any wrapping paper so need to add that to my list! 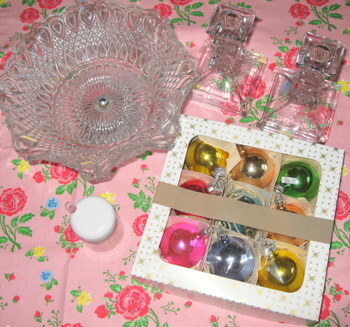 This came the other day from Gill, and was a giveaway I won from her lovely blog. 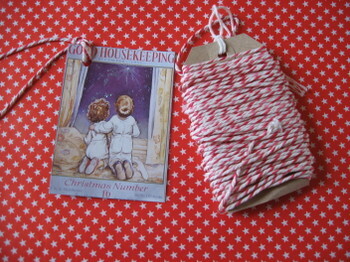 It's perfect for the gift tags I've been making, and I love the little tag that came with it. Thank you all once again for your lovely comments. I have even had some new bloggers leaving messages which is great. I hope you are all keeping nice and toasty, and your preparations are coming together. It's happened. The Christmas spirit has finally kicked in! At long last. As I said before, the planning and excitement (but not the shopping) usually starts in August for me, but this year has been a little late in coming. I think that getting Ofsted out of the way and a few other slightly stressful issues resolved has meant that I am now relaxed and festive. Andy came home on Thursday with the tree, and actually had it sharpened at the base so it would fit in the holder. So this year I didn't cry or get in a strop. We never have the right saw and it takes hours to get the nobbles cut off, by which time the girls have got bored waiting and wandered off. Not this year though. It was up and decorated very swiftly. 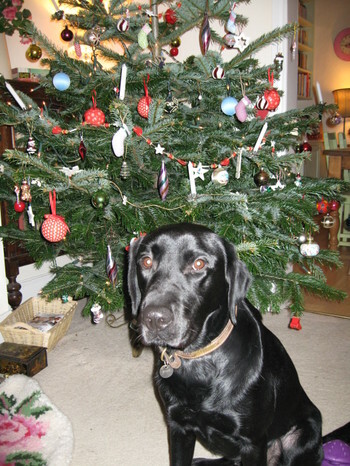 Bodie was most interested, but the only bauble casualty was as a result of his tail so the vintage ones have been moved higher up and the cheap modern ones are in dog range! I was all set to write my cards last night with a quiet bottle of wine in front of the fire as Andy was on his Christmas do with work and I thought he'd be out late. I had the girls' best friends over for tea after school as their parents went to the races. They came back at about half 6, slightly the worse for wear and having won some money on several horses. Andy came home soon after so we all ended up having a curry and wine. We had a very jolly evening and the girls finally went to bed at about 10.30. As they were a tad grumpy today we had a quiet morning in followed by a walk on the hill (there were even a few flakes of snow, but nothing substantial). I have ordered heaps of presents today on line and have planned the menus and ordered a Sainsburys shop to be delivered on Wednesday evening. I am going to do my cards tonight and a final present shop in town on Monday. I do believe I am getting there! Every year I panic and say I am going to start early next year, and every year I leave it to the last minute. However I am now buoyed up with the excitement of shopping and decorating, so there are benefits to leaving it for the last week or so. I have also treated myself recently to goodies from fellow bloggers. 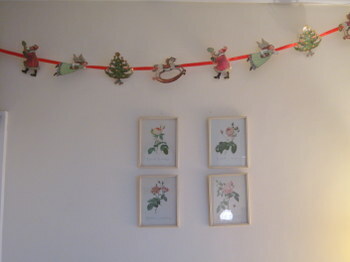 and this gorgeous mini bunting is from Lobster & Swan's inspirational blog. Sorry for the terrible photo - it's dark and I can't wait until morning! Thanks for all your lovely comments by the way. I have added a bottle of Winter Pimms and some apple juice to the Sainsbury's shop (thanks for the tip, Jess! ), so I'm looking forward to sampling that on Wednesday night (I may need it - my friend Sophie and I are taking our 4 girls out for dinner). We are now snuggling down with one of Andy's chilli con carnes bubbling on the stove and Strictly Come Dancing on the telly (Grace and I are rooting for Gethin, but I do like Alesha too). Hope you are all feeling festive and jolly. They've gone! 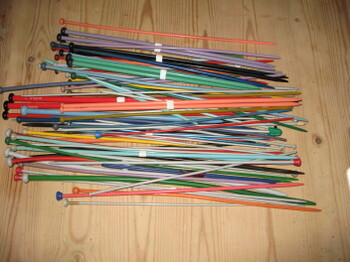 The Ofsted inspectors have packed their briefcases and moved on. It was a very stressful experience for all involved but we did really well and can relax now in time for the end of term. Everyone put so much work and time in to preparing over the weekend and were absolutely exhausted by the end of the day. Still, that's it done and dusted for the next 3 or 4 years. It is such a lovely school and I am proud to be a part of it and am thrilled that my children are getting such a great school experience. So, not much else to report as I haven't had time to write christmas cards, buy presents, make presents,make puddings, decorate the house etc. Still, I have been tagged for the first time ever, by linaloo, so here goes. 8 interesting (?) Christmassy things about me. 1. Mulled wine is my favourite drink in Winter (Pimms in Summer), but Andy isn't keen so we don't have it often enough. I have decided to buy some of the ready made bottles of it this year and just heat it up for myself. 2. I have a secret love of tacky Christmas lights - particularly outside ones. Every year we drive around the hot spots of Cheltenham looking for the best ones armed with popcorn and a flask of hot chocolate. 3. I start planning Christmas things in August, but only in my head. 4. Andy hates the build up to Christmas, so much so that his office brought in a huge bag of decorations in November to decorate his desk with whilst he was at a meeting. For someone who loves Christmas so much it can be frustrating being married to a Noelophobe. (He does love the day itself though). 5. Sprouts are my favourite vegetable. I am so pleased that this year we will be eating our own grown sprouts from the allotment as I have never had success with them before. 6. 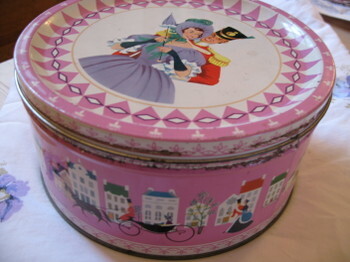 The Christmas present that most stands out for me from my childhood was a Sindy dresser with candlesticks, knives and forks, wine glasses etc that I got from Father Christmas. I woke up as my parents were going to bed and thought they were getting up so I started opening my stocking, and was so disappointed when my Mum made me go back to sleep! 7. In The Bleak Midwinter is my favourite Christmas carol, despite it being melancholy. 8. I could eat Christmas food all year round - I love Christmas cake, Christmas pudding, mince pies, cranberry sauce, bread sauce, brandy sauce - everything in fact that you only get at Christmas. My mum and dad used to get me a Christmas cake for my birthday cake as I love it so much. So, there you go. My first tagging. 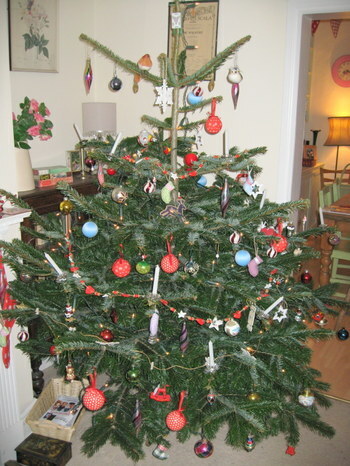 Not hugely exciting for you all I'm sure, but it has served to make me feel more Christmassy, so thank you Linaloo. I don't know who else to tag - most people already seem to have been tagged, so I will leave it up to you to join in if you wish. 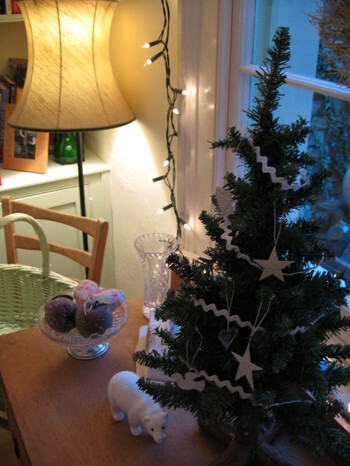 I will aim to do a more exciting post in the next few days - hopefully once our tree is up. 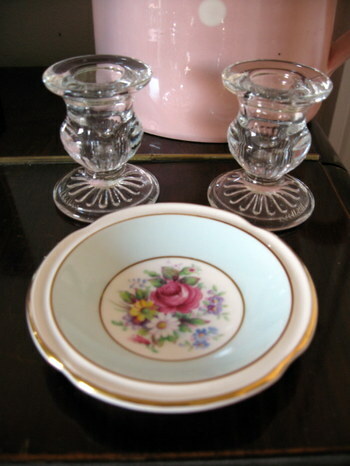 I can also show you the photo of the gorgeous things I bought from The White Verandah, a lovely blog and new online shop. I have actually taken the photo but haven't the energy to download it tonight (sorry Jess). Once post-Ofsted fatigue has worn off I shall be back on top blogging form! Well, Andy is home tomorrow (hopefully - weather dependent) and I haven't achieved anything that was on my list of things to do while he was away. It has been a fairly stressful week, and the chilled out feeling I came back from holiday with is a dim and distant memory. 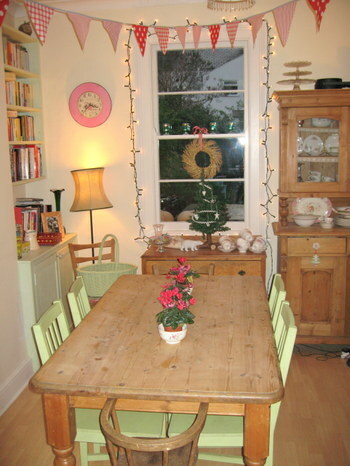 I had planned to really sort out the house ready for Christmas (we are having only our 2nd ever Christmas here and I want it to be really gleaming in preparation), along with fixing things, painting and sewing. Sadly, none of these things have occurred! I did have the girls round for wine and nibbles on Wednesday which was really nice, and had been planned for ages as Andy was out of the way! Aside from that I don't know where the time has gone. So, I just had to cheer myself up with a little retail therapy. And oh, how it works (that and wine)! The glass bowl will look great with some Christmas decs or the Hersey's Kisses Andy had better be bringing back from the US! The candlesticks have joined the others on the mantelpiece and have already been put to good use. Why must people ruin a lovely box of decs with parcel tape? Still, I love the colours and no one but me will ever look at the box, so I don't suppose it really matters! The fabric in the background is a tea towel for £1.99 from Cancer Research. I am going to go back and buy a few more to make into cushions for my dining room chairs. This little jam pot was £1! 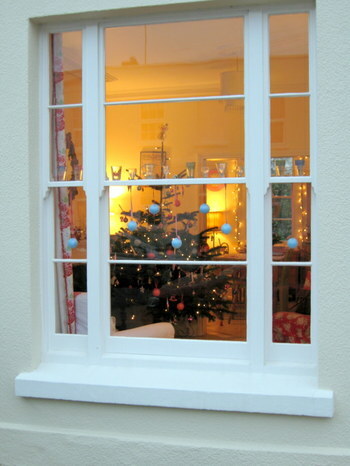 This will look great covered in mince pies. 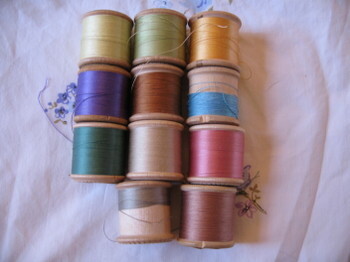 This is for all my embroidery floss which is in a plastic bag at the mo. And this little beauty was my find of the day. 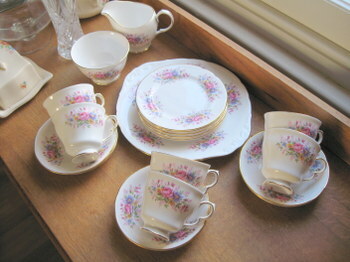 It is Queen Anne bone china and was in a charity shop that was closed. I looked through the window and saw this, and I thought the price tag said £20. 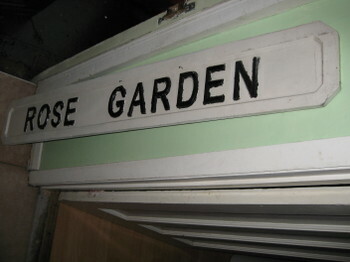 I popped back later on when it was open only to find that it was £3. 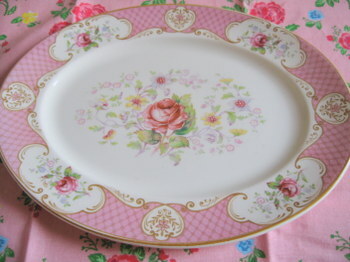 It is in immaculate condition and is soooo pretty. I know I didn't need it but I really couldn't resist. I would have skipped home only I was worried about chipping it! 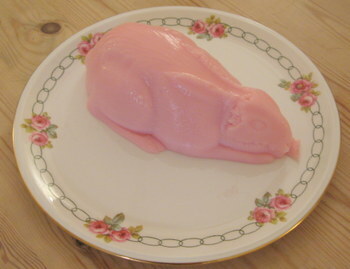 When I was a child I loved blancmange but we never had it at home. I saw a packet in the shop the other day and made it for the girls (and I) to scoff after Brownies. Why is it that they never come out of the mold in one piece? This one looks slightly deformed, and didn't taste great either as I burnt the milk, but the vanilla one I did 2nd time around was lovely - it took me back to my friend's grandma's house which was also the first place I ever ate rice pudding! These were an ebay purchase to set me up for my new found hobby. One of the things on my list was to get knitting this week, but that too has gone out of the window, along with painting all the furniture that needs doing (stacks as I keep putting it off), painting the tiles in the kitchen, sewing all of the things in the Sew Pretty Homestyle book that I got for my birthday, making my Christmas puddings, reading my book club book, sorting out the Christmas decorations etc etc ad infinitum. I actually haven't felt very christmassy at all recently. Normally I start getting excited in about August, but this year I feel a bit lack lustre about it all. I think I will start once Ofsted have gone, but despite going to one of my favourite places in the whole wide world for Christmas stuff yesterday I don't feel remotely festive. Burford Garden Centre is a fabulous place for pretty things and inspiration. They have an enormous food hall, children's section, Christmas section, stationery, cards, smellies, bags etc etc. I did manage to get a few things (some photos below, but some things can't be shown as Grace likes to check out my blog occasionally, and surprises may be spoilt). 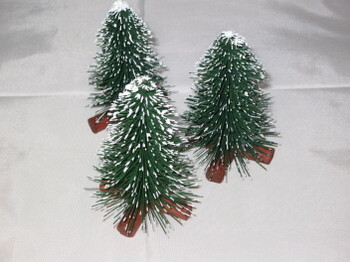 I love these trees and have seen quite a few of you using them in your Christmas scenes. 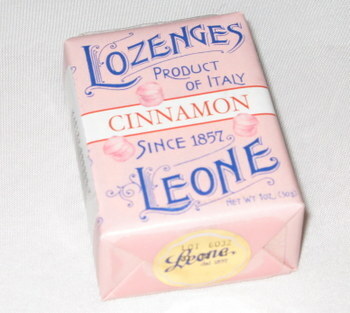 Isn't this the prettiest packaging you have ever seen? 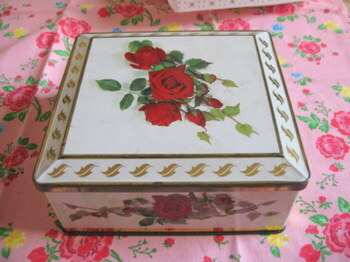 I am thinking about making a lining out of oilcloth for this and using it for picnics (a la Kidston!). 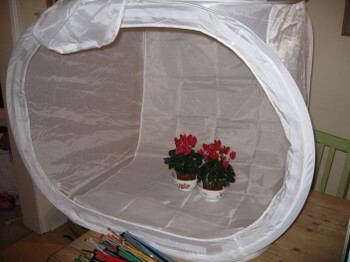 This is my new purchase to help me with my website photos. It is much bigger than I was expecting, and I have got to work out lighting etc (and how to iron the background! ), but I am really excited about the possibilities. The cyclamen were a bargain from Wilkos of all places. I did buy 3 but one is really droopy now and I am not sure why. Any ideas for how to perk it up gratefully received. 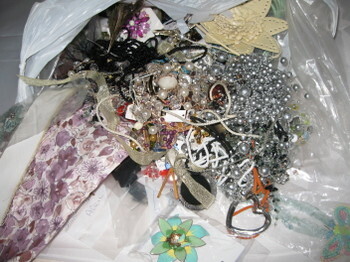 And finally, (not to sound too much like John Craven's Newsround), my gorgeous friend Tala who runs an amazing jewellery stall appeared in the playground the other day with this enormous bag of broken jewellery for me to break up and use in my creations. I haven't had time to go through it yet, but there is heaps of stuff in there and I can't wait to see what treasures emerge! So, all in all a hectic week, and not hugely productive. I can see you all making wonderful things for your families and stalls, and I am frustrated that I haven't got the time to get sewing at the moment. I really miss getting cozy in my studio with the radio on and the fabric piled up around me. I think in the New Year it will be easier and I will be able to create all the things I have rattling around in my head. Thanks again for all your lovely comments and suggestions for magazines. I am sorry I have been rubbish at leaving comments for you all this week, and I promise to try harder next week!! Hopefully the next time you hear from me I will have refound that chilled out feeling and Christmas spirit! Hi everyone...I'm back! Hope you have all had a lovely week. I haven't had chance to catch up on what you are all doing, but I will be ploughing through the several hundred bloglines entries over the next few days. Well, we had a lovely time away. It seems to have flown by. We went swimming several times, walking, playing games, visited Newark (where I had a minor strop at not having time to visit the Antiques centre due to very cold and tired children), lunches out, shopping etc etc. Some family friends visited us for the day and the men played golf several times. All in all a very successful trip. This is our fifth year of going and we are getting to know the area really well and which pubs to go to! 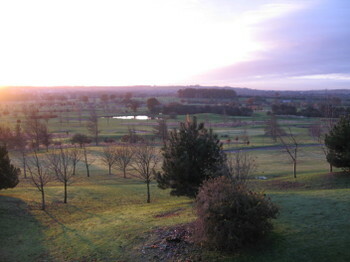 This is the view from our balcony. What a great sight to wake up to every day. This is Grace doing what she loves best. She is mad about birds of prey, and there was a demonstration in the hotel grounds. 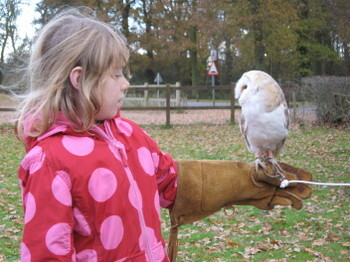 There were only us and one other family so we all had loads of goes at holding the birds. Grace also managed to fill in heaps of her bird book - we even saw Goldcrests which I had never heard of before. There were deer and pheasants roaming in front of our lodge too. 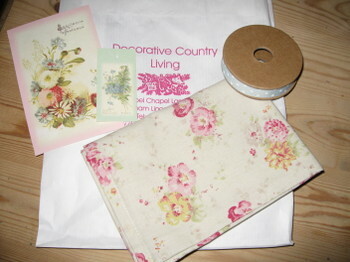 I did manage a trip to Decorative Country Living, which is great for inspiration. I bought a couple of things, but couldn't afford the rest! It is very pricey but lovely to look round. The fabric is actually a tea towel but I think I may make a cushion out of it. Isn't it fab?! (Sorry about the terrible picture - it was raining and I couldn't face taking it outside). It is cast iron and looks like it was from a stately home or some such place. There were 3 others - Swimming Pool, Duck Pond and The Maze, but they would have been a bit too much for my little garden. We are planning on having the garden altered next Spring so this will look great on the wall when it is finished. 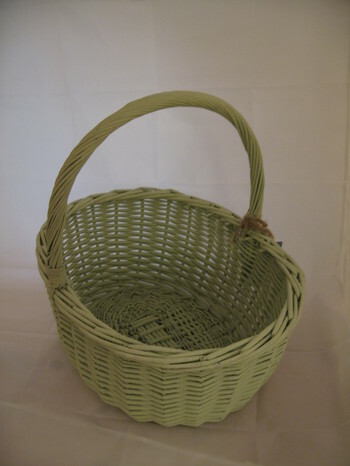 I did manage to get some other bargains in Newark as it was the day of the bric a brac market. 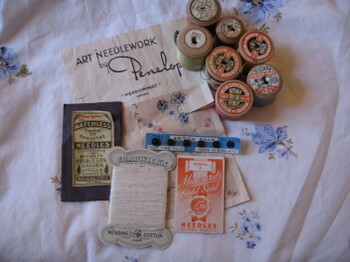 This tin has heaps of sewing bits and bobs - including some lovely threads. The colours are great, but haven't photographed brilliantly. It is so hard in dull rainy light. 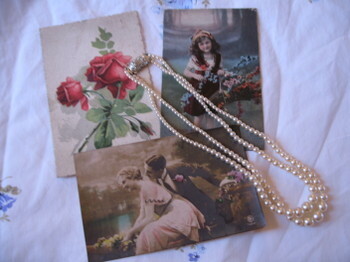 I also got a pearl necklace and 3 vintage postcards. I'm planning to scan them in and use them for some new designs. The other great thing about our holiday was that my Mum finally managed to teach me to knit. I haven't done much, but it is coming on, and I am getting better. I still can't do it in front of the telly though as I keep missing bits, but I will struggle on! I am hoping to make some of Dottycookie's puds for some Xmas cards, but think that may be a tad ambitious at the mo! Bodie was very pleased to see us and has spent the whole time since his return curled up on the rosy rug in front of the fire with a blissed out look on his face. He is man of the house this week as Andy went off to the US this morning. Please can someone recommend some good mags for him to bring home for me? I already get the Country Living one, and am a bit off Martha Stewart at the mo (it is all a bit too glam and contrived for me). Any suggestions will be gratefully received.